Parental controls can filter the web, blocking inadvertent access to inappropriate websites. There are a variety of ways to do this, from configuring network-wide parental controls on your router to using the parental controls built into Windows or third-party software. Web filtering is best used to restrict the web for young children, preventing them from accidentally wandering into the seedier corners of the Internet. Teenagers are adept at finding their ways around parental controls if they want to. One of the easiest ways to set up parental controls is by configuring them on your router. Your router functions as the choke point where all the Internet traffic for your network flows through. Setting up parental controls here will allow you to perform web filtering for all the devices on your network — computers, smartphones, tablets, and even game consoles with built-in browsers. Some routers ship with built-in parental controls. If your router has this feature, it will often be advertised on the box and will generally be explained in the manual. You can go to the router’s web-based configuration pages and set up the parental controls for your network. Many routers don’t include parental controls, but you can use OpenDNS to set up parental controls on any router. To do this, you’ll just need to change your router’s DNS server settings to use OpenDNS. OpenDNS allows you to set up an account and configure web filtering — you can select different types of categories of websites to block. Websites you block will redirect to a “This site is blocked” message when visited on your network. For more information about changing your router’s settings, refer to its manual. If you would like a device on your network not to be filtered, you can change its DNS server manually so it won’t use OpenDNS. Of course, this means that anyone on your network can change their DNS server and bypass the filtering. Like we said, such filters can be helpful for your children, but a teenager can get around it. 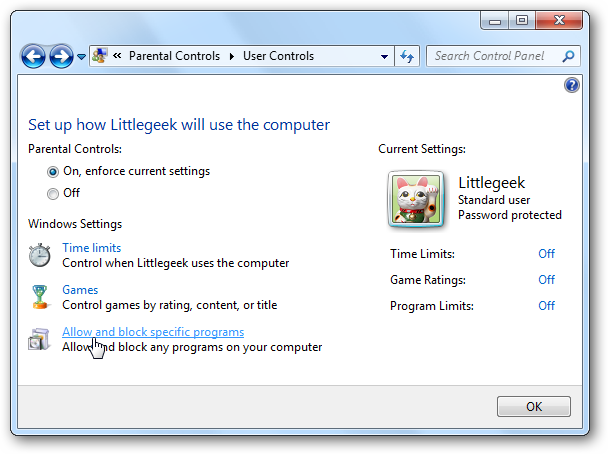 Windows 7 has some built-in parental controls that allow you to control what time a user account can log into the computer and what programs it can use. This is helpful if your kids use separate user accounts on your computer. However, Windows 7 doesn’t include a web filter. 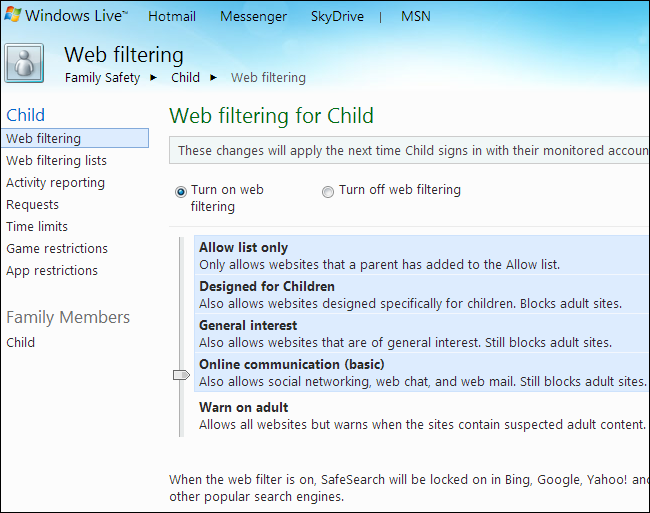 Microsoft does still offer Family Safety, a free program that allows you to set up web filtering on Windows 7. Install the Family Safety program on your Windows 7 computer and you’ll be able to manage its settings from Microsoft’s Family Safety website. The program is available as part of Microsoft’s Windows Essentials package. Windows 8 and Windows 10 have integrated parental controls that combine Windows 7’s time limits and program access controls with Family Safety’s web filtering and more new features. You can manage your settings and view reports from the same Family Safety website. All you need to do is check the “Is this a child’s account?” box when setting up a new user account on Windows 8. The account will be marked as a child’s account and can be managed from the Family Safety website online. Read more about using parental controls on Windows 8. You can also turn to third-party parental controls. Many Internet security suites come with built-in parental controls. If you have a security suite installed on your computer, check if it has built-in parental controls. There are also dedicated parental control solutions you can pay for, like the famous Net Nanny that everyone has heard of. However, you don’t need to pay for a parental control solution. There are many other free web filtering solutions you can use. For example, Norton offers a free Norton Family parental control application that seems to be widely recommended. Try doing a search online and you’ll find many other options that may fit your needs. Of course, no parental controls are perfect. They won’t block everything bad and may occasionally block something good. Sufficiently motivated teenagers can also get around them, if only by leaving your house and accessing the Internet elsewhere or using their smartphone.